"I'll just ... I'll just wait here, shall I? 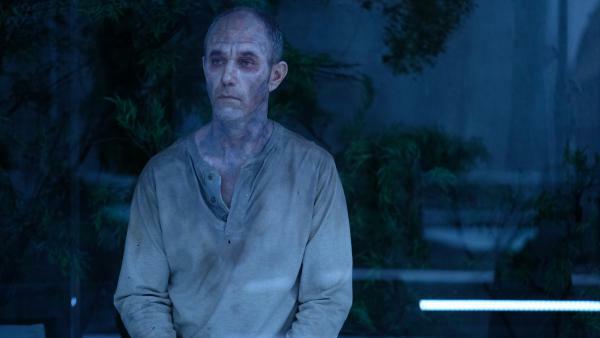 ": On The Passage, evil Tim Fanning (Jamie McShane) can't help but look bored as he bides his time. And bides, and bides and bides. The best-selling trilogy of novels by Justin Cronin — The Passage, The Twelve and The City of Mirrors — collectively form an epic tale, sweeping in scope. Combining apocalyptic fiction with straight-up horror, the books hop around in time — well, I say "hop" — they long-jump around in time, from the near-future, when a secret team of government scientists attempts to develop a formula that will render humanity immune to disease, to 1,000 years hence, long after that bright idea has borne its inevitable, nasty, blood-sucking fruit: vampires called "virals" that have wiped out most of the world. It's pulpy going, sure — part I Am Legend, part The Walking Dead, part The Stand — but all those familiar, pulpy components cohere into something hugely satisfying, because Cronin is so good at establishing the vastness of the world he creates: shocks and twists abound, characters thought dead return after looooong absences, and there's a palpable sense of humanity's enduring legacy — its triumphs and missteps — on a planet where only a hardy few huddle together in far-flung outposts. It's big, in other words. Vast. But the new FOX series The Passage — named for the first book in Cronin's trilogy, but based, we are assured, on all three of them — isn't. At least, not yet. What The Passage doesn't feature a lot of, at least at this early stage, is a definable sense of menace, or any real inkling of the (much, much) wider story that Cronin's trilogy encompasses. Which is fine, as far as it goes. Those who have read the books know what's coming; those who haven't will just have to content themselves with the ominous voiceover supplied by the show's breakout star, young Saniyya Sidney. Assured and charismatic, Sidney plays Amy, the girl who may or may not hold the key to humanity's survival — which is why the show's various factions spend these first few episodes fighting over her. Basically: The secret cabal of scientists wants to inject Amy with their formula, which causes their best agent (Mark-Paul Gosselaar) to rebel against his orders and take her on the lam. The series devotes much of its running time, in the first three episodes, to establishing the bond between Amy and Gosselaar's Agent Wolgast, which makes sense — any show with this many high-concept trappings needs a believable human relationship or two to provide emotional ballast. But those scenes, as appealing as they are, mean that the show has to work harder to convince us that the "virals" — previously injected humans who harbor the vamp-virus, kept prisoner by the scientists — pose a clear, present and growing danger. The Passage sets about this crucial task by employing that aformentioned voiceover, by having various characters mutter vague presentiments ("Something is coming," one whispers, "and it's not good") and by having the various virals enter the dreams of the facility's staffers, the way that Big Bads on serialized action/horror shows are so wont to do. The series attempts to generate a sense of dread by keeping its Biggest Bad in its back pocket, early on. Played by James McShane, the lead viral-vamp has a name — Tim Fanning — that doesn't so much evoke blood-curdling terror as it does the desire to call your local dealership to schedule a tune-up. McShane does what he can, but the precious screen time he's allotted isn't enough to establish him as much more than a pale guy with bad skin sitting in a cell, biding his time. The producers' go-to scare tactic — having McShane, or one of his fellow virals, suddenly grimace and hiss — doesn't pack quite the punch they want it to. The show's over-reliance on it in these early episodes might leave viewers who haven't read the books wondering if there's enough here to keep them watching. There is more, of course, much more — in the books at least: shocks, to be sure. But they also serve up something larger, deeper and more enduring: fleeting flickers of hope amid the soul-crushing hopelessness of the end of the world. The FOX series isn't there yet, and given its slow-burn pacing, likely won't get there for a season or two. Given the constraints of television production schedules, and production budgets, it may never manage to convey the yawning horror the books so effectively evoke. Maybe it doesn't have to. Maybe it will seek instead to downsize the books' epic conflicts, and their huge cast of characters, to fit the television screen. It's a worthy endeavor, focusing on intimate human relationships amid the spectacular fall of civilization. But for it to work in the long run, The Passage will need to start balancing the strength of the bond between its two principals with a clearer, stronger sense of the real horror they're facing.